Amino Humic Shiny Balls (Dark Gold) are used to improve soil structure. It is specially made round granules for soil application. It is combination of Amino Acid, Humic Acid, Fulvic Acid, Potash, etc. Research and study shows that this product can increase crop yield by 10-20% can be used in any crops. Mainly used for soil application, growth promoting, root developing. Recommended Crops: Any Field Crops and/or Horticultural Crops Vegetables. Compatibility: Mix with all types of Pesticides/Fungicides and PGR product. Content: Amino Humic Shiny Ball. 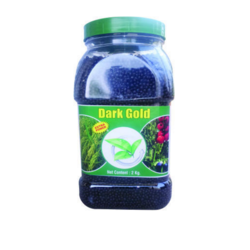 Specifications: Available in 1.800 kg Jar packing size. Dose: 1.800 kg /per acre. Bulk Packing:- 25kg and 40Kg HDPE Bag.